Hush a Bye are part of the Airsprung group of companies and offer a higher quality product than Airsprung but not quite as good as Gainsborough. Although they do offer pocket & memory divan beds and mattresses, something that Gainsborough do not make. 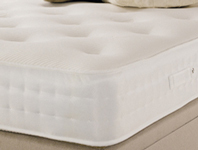 The quality of their divan bases is much the same as Gainsborough and all their beds and mattresses comes with a 5 year warranty.